Located at The Framemaker in Carrigaline Industrial Park, Carrigaline, the space benefits from good light, spacious studio / gallery with high ceilings. Paint in a relaxed atmosphere. A learning experience for all, from absolute beginner to the experienced artist. In order that I can provide suitable individual attention, classes are limited to approximately six artists per session. These sessions are relaxed and cater for all levels of experience. Interesting discussion is common, about colour, techniques and the world of painting in general, and is integral in the advancement of anyone as an artist. Quite often I choose a suitable painting subject, for example, a Monet painting, and then I carry out a painting demonstration and the group paint along with me. 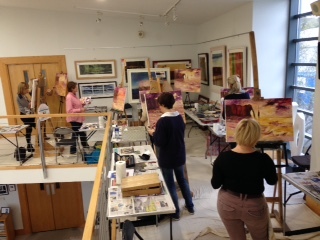 Other participants may decide to paint a subject of their own choice, which they bring to the class. I offer guidance with this also. Good fun with tea and coffee in good supply! Private specialised tuition is provided. 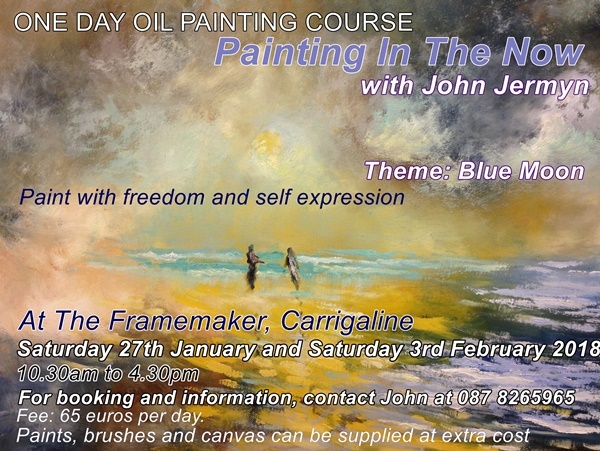 This also takes place at The Framemaker. The participating artist will receive hands on guidance. This is a very enjoyable experience as I too shall paint with you, and it is always exciting to see the two paintings progress, side by side. These sessions create a relaxed, quiet and rewarding experience. It is guided to all levels of painting experience. 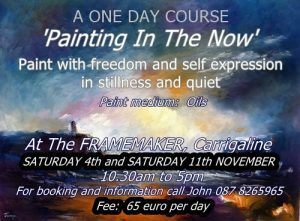 I welcome anyone who simply wishes to come along and paint in a quiet and laid back atmosphere, in order to get away from it all, away from the temsions and strains of everyday life. Painting in this way provides wonderful peace and rebuilding. One will leave the painting session satisfied and fulfilled. I offer individual tuition to anyone at their home, should they be unable to come to the studio. Feel free to email or phone for any information should this be of interest to you. By appointment. 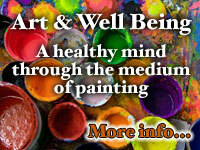 This is a fascinating exploration in mindfulness, through the realm of painting. Using the power of your being, you will be gently guided through the process of creating imagery, based on your senses and emotional values. As you let go of structures and of definate imagery, you soon realise that you can interpret from your imagination. As you progress with a painting in this way you will notice signals, which lead you to other stages of the painting. Something begins to emerge. Go with it, changing it or redressing it here, using your instict. You become fluid in the delivery of the painting. With practice, you become aware when you have been successful – you acknowledge that the painting is now finished, because the painting will communicate to you. This is very powerful and highly satisfying. Painting in this method promotes the artist to become an individual painter. Once hooked, this avenue of approach is always available to you. The trick is to let go of everything and be willing to immerse yourself into the painting and be open to receiving signals ! Mindfulness involves being with your thoughts as they are, neither grasping at them nor pushing them away. Even better, is if you paint in silence, which is wondefully empowering, particularly in a small group of people. You will feel refreshed and uplifted with a great sense of achievement. Catch the painting in the moment ! Ideally, you should do the whole painting from start to finish in one setting, of perhaps one or two hours. The experience and essence is lost if you choose to return to the artwork at another time. Nail it in one go! PAINT LIKE THE IMPRESSIONISTS This workshop is ideal for painters of all levels who would like to learn to paint like the great Impressionists, such as Monet, Renoir and Eduard Manet. The course will focus on the use of light and color to create beautiful paintings using a minimum of bold and confident brush strokes. Other important principles of painting will also be emphasized including drawing, composition, and tonal values. The workshop will feature demonstrations and individual attention focused on each participant’s unique needs. Impressionist painting remains the most attractive period in the history of modern art and the most appreciated by the public. Series of exhibitions, an abundant literature and record sales give evidence of today’s extraordinary resonance of works of the Impressionist painters, of which a number are engraved on our artistic conscience . At their time, Impressionist works appeared to be so outrageously modern, that it took their contemporaries more than thirty years to finally admit them – if not to like them -. However, as the years go by, Impressionism, seems to us nowadays, much more to maintain close links with tradition, and to constitute the aesthetic achievement of an artistic creation related to realistic representation. This link, long time considered as the most normal thing in the world, to which impressionism had given a new definition based on“impression“, will thereafter lose its compulsory character with the evolution of fine arts in XXth century. The durable success of Impressionism is due to the fact that we are sensitive to its modernity and to its traditionalism. Impressionism cannot be reduced to this unique aspect, it is also a bias to paint cheerful reality, that of leisures and beauty of nature, an endless search for natural light… in a word, a certain art of living which fits in with many aspirations of our society. Tonalism – a distinctive style of low-toned atmospheric landscape painting, developed a sizable following among American artists in the 1880s. This new generation of tonalist artists, most born after 1845, and many foreign trained in Paris and Munich, broke with the prevailing school of Hudson River artists and their large detailed panoramic views of the American scenes. Many streams of influences fed into the growing taste for a more intimate, poetic, and expressive style of landscape art, relying on soft-edged broadly painted tonalities to communicate emotion. Tonalism is rooted in the French Barbizon movement, which emphasized atmosphere and shadow. The Tonalist style employs a distinctive technique by the use of color’s middle values as opposed to stronger contrast and high chroma. Resulting in a understated and compelling overall effect. The tonalist subject matter is never entirely apparent; there is no effort to communicate a message or narrate a story. Instead of relating a story, each sensitively chosen color, composition, and line is arranged to create an intriguing visual poem. Key terms and phrase associated with the tonalist movement – obscured details, single-figure themes, the natural and spiritual domain, waking, unconscious states, dreams, aura, emotionalism, pictorial space, compositional space, diffused light, incandescent glow, artistic inspiration, illusionistic representation, luminous, transcendentalist, glowing, poetic, evocative. Expression and the interpretation of sense covers a wide cross section of elements. During the course, I will attempt to bring you through and share with you some of these factors and how to harness it. Many artists struggle in connecting with and transferring vital elements of ourselves such as feeling and emotion which above all leads to expression. This is where the difficulty lies for many of us – How deep can I dive within myself and then be able to transfer or express this thought or feeling into a painting ? Without this understanding it can cause us to have problems in not being able to achieve the measure of satisfaction that we would wish for in the creation of a painting. The viewer looking at the work sees this also. When we hear someone comment and say that ‘the painting has got soul’ then they are seeing a part of the artist’s makeup and not just a work of art. Learning to understand and work with our own expression opens up many new avenues and will prove to be both rewarding and ultimately satisfying. Once understood, one then becomes a fully absorbed artist because our everyday life experiences and that of others are constantly being related to and transferred onto a canvas, even if only in thought. understanding landscape and seascape and how the human form can relate to it. Balance . Use of paint . Use of colour . When it is best not to use a brush but to try some other tool for better effect. Working and connecting with natures elements, such as sea and sky, to open our minds to freedom, expression and beyond. Using your imagination. Each artist will be gently guided through this process. The emphasis at this point is to steer away from reality as we see it to reality as we feel it – through painting.